Lighthouse Baptist Church is a warm and caring fellowship of believers committed to the truth of God’s Word. We really are committed to standing on the Word of God without compromise. We are reaching out, in love, to those in need of Christ through many different ministries. Our focus is Christ and His work. Our field is the world. 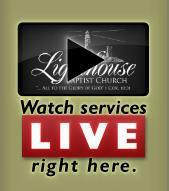 Come see...and feel for yourself the warmth of Lighthouse Baptist Church.